The oldest light sources are the stars, and in our case the Sun. On earth the oldest source of light is burning something. Note 1: Lumens = 12.57 * Standard Candle Power, so 16 SCP is about 200 Lumens. This was the size of Edison's light bulb for many years. "The replacement of candles and lamps by gas worked a revolution, not only in the convenience of artificial lighting, but in its hygienic relations. The older illuminants in proportion to their luminous effect removed prodigious amounts of oxygen from the air and gave off large quantities of carbonic acid. In the days of candles a brilliantly lighted room was almost of necessity one in which the air was bad." "It is somewhat startling to realize, but very desirable to remember, that a common gas burner will vitiate the air of a room as much as four or five persons, in so far, at least, as vitiation can be defined by change in the chemical composition of the air." This is still a problem for women and children in third world countries because they are mostly in the home which uses flame based light and cooking. Carbon Arc lights (Wiki: Carbon arc lamp) predate heated filament Edison type lamps. They were used in radar controlled W.W. II search lights, lantern slide and movie projectors, inside lights for large public meeting halls, etc. There are some modern arc lamps that use Tungsten instead of carbon electrodes (Wiki: Arc Lamp, ) for automotive headlights (HID) and other applications where a very bright light is needed. Different gases can be used in the lamp such as (Wiki links follow:) Neon, Argon, Xenon, Krypton, Sodium, metal halide, Mercury vapor. Vietnam era VSS-1/GSS-14 or VSS-3 Xenon arc lights were fitted on tanks and gun trucks, some with near IR filters to they were not typically visible to the enemy. All (Wiki:fluorescent lamps) are really Mercury vapor arc lamps with a (Wiki: phosphor) coating on the inside of the glass to convert the UV to visible light. This includes the Compact Fluorescent lamps that are green in the sense of using less electricity but not green in the sense of having Mercury inside them. Mantle type lamps produce much more light than wick type lamps. But mantle lamps do not have a hot body spectrum but instead have narrow peaks in the spectrum due to the rare earth elements that are impregnated into the mantle (Wiki). This is very similar to the "white" LEDs now on the market or to florescent lights. This would include whale oil lamps, kerosene lamps, gasoline, diesel, etc. I think the US GI M1950 gas single burner stove is from the Petromax design and was also made by Coleman as their camping stove. The original air pump was made like a small version of a bicycle tire pump using leather as the seal. The O-Ring modification replaces the leather with an O-ring making for a better seal. Safety - to prevent the flame from igniting an explosive atmosphere. These are mostly Gas mantle types. 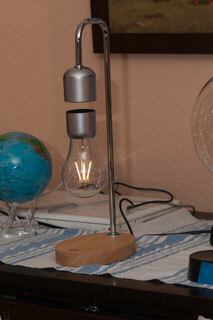 This would include natural gas like was used for public lamps or propane like in camping lamps. Also "carbide lamps" that combine water and calcium carbide to make acetylene gas. Note that you can not compress acetylene gas, but instead it needs to be absorbed in a liquid, like in welding tanks. The carbide lamps typically have a long skinny white flame that puts out soot. There are small versions of this lamp made to apply the soot to gun sights to make them black (to reduce the reflection of the sun). Limelight is when Calcium Oxide is heated like with an oxygen-hydrogen flame. Candles are the most common but there are also chemical pellets what will burn. A wood fire makes light and heat. This was one of Edison's inventions. 223898 Electric Lamp, T.A. Edison, Jan 27, 1880, 313/315 ; 201/25; 252/502; 264/29.2; 264/DIG.19; 313/333; 313/344; 313/578 - uses a heated filament. Does not include the Edison base. Note that a filament type lamp will last longer if the filament is horizontal. If the filament is vertical then the top gets hotter and fails sooner. Most bulbs are designed to be either screwed into an overhead fixture or a table lamp but if that same bulb is screwed into a makeup mirror it will fail sooner. There's a trade off in how long a filament lamp will operate and it's rated voltage and brightness. Also there is a cost associated with bulb replacement. All of these need to be taken into account when deciding which bulb is a "better buy". The standard screw base for light bulbs in the U.S. is the so called E26. This is really a 1" base (25.4 mm) rounded up to 26 mm. In Europe, for an unknown reason, they use E27 for light bulbs. I suspect the E26 and E27 are interchangeable. There are also arc type lamps. Gas filled lamps like neon get their color from the gas used. Electroluminescent (Wiki:EL) lamps use a very small amount of power but degrade with use and do not look nice after a year or more. Light Emitting Diodes (LED) and the newer Organic LEDs are semiconductor junctions that emit light. The fluorescent lamp is an electrical discharge type light source and the compact fluorescent is very energy efficient, but contains Mercury. 514170 Incandescent Electrical Light, N. Tesla, Feb 6, 1894, 313/315 - now called a plasma lamp. A strobe light is only on for a very short amount of time, but is very bright. Although there are Xenon arc lamps that can be on all the time, they are very specialized. When a fluorescent lamp bulb is in an RF field it will glow even though it's not connected to anything. Livermore, Calif - Longest burning light bulb -" The improved incandescent lamp, invented by Adolphe A. Chaillet, was made by the Shelby Electric Company. It is a hand blown bulb with carbon filament. Approximate wattage-4 watts. Left burning continuously in firehouse as a nightlight over the fire trucks." 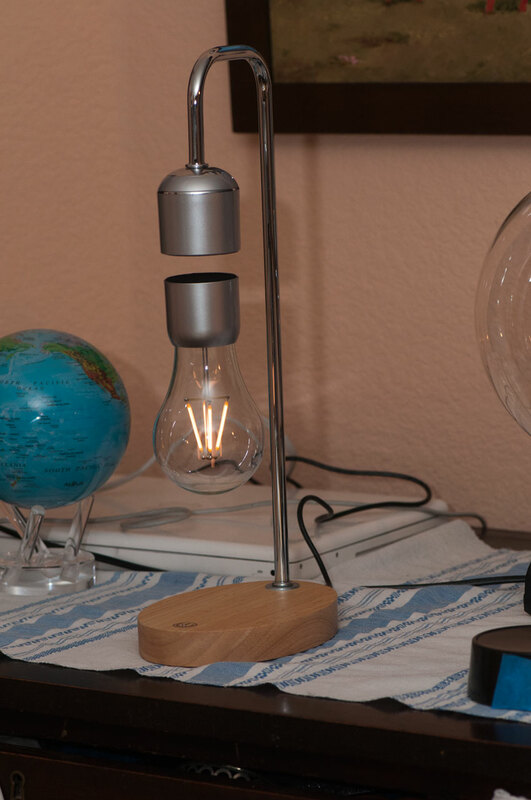 See the Magnetic Levitating Lamp which uses a low voltage "Filament" COB (Chip On Board) lamp that has the look of an antique lamp. Light sticks work based on a chemical reaction. Chemiluminescence (Wiki) - the mechanism used in light sticks. By combining a radio active source and a phosphor and/or scintillator you get a light that shines 24/7. In the 1930s and during W.W.II there were clocks, watches and aircraft instruments made where the dial face numbers were hand painted using a combination of radium (Wiki) and phosphorescent (self glowing) paint. At the time they didn't know about the health hazards of radium and the women who applied the radium laced paint put the brush in their mouth to form a fine point. See the PBS documentary American Experience: The Poisoner's Handbook or the book The Poisoner's Handbook. In reading the reviews of the book on Amazon there are those who know chemistry pointing out many technical errors and there are reviews that give the book 5 stars because they were fascinated by the factual history. When they are activated they give off light. Commonly used in Cathode Ray Tubes (CRT) and fluorescent lamps, white LEDs, light sticks. Some laundry detergents have phosphors to make the whites look whiter (they glow under UV light). A phosphor can be activated by light (including UV or black light), electrons, radioactivity or chemically. A scintillator can be a crystal, plastic or liquid that emits a photon of light when it absorbs electromagnetic or atomic particle radiation. Generate light when struck by electrons, neutrons, photons or other ionizing radiation. Also used in some LEDs to convert near UV to other colors like white. When what you're measuring is the brightness of "light" then the measurements are weighted so that the answer has the same spectral response of the human eye. This is different than measuring the power of the light source, which has a flat spectral response. There are a number of characteristics of a light source that can be measured. These can be measured only in the visible range (400 to 700 nm) which is done to determine how a human eye will react to the light, or over a broader wavelength range to see how photo sensors will react to the radiation. There is only a small band of radiation with a wavelength shorter than 400 nm that can propagate through the atmosphere, but there are many orders of magnitude of longer wavelength electromagnetic radiation that propagate called near infrared, far infrared (heat), then various radio waves. The historical method of measuring the visible brightness of a light was using the Weston Model 594 Photronic Cell and I believe is the basis of many of the specifications relating to visible light. The Amprobe (Meterman) LM631A Digital Light Meter is the most popular meter used on the Candle Power Forum for testing flashlights. It has calibrated readings in foot-candles (Wiki: foot-candle)or lux (Wiki: lux) (1 lumen per square meter). One foot-candle is equal to approximately 10.764 lux. An Optical Spectrum Analyzer is used to measure the brightens at different wavelengths. A number of them are on my OSA web page. While looking for Lighter patents in class 431 Combustion for the year 1906 most of them were for lighting either open flame or incandescent. Fuels were natural gas, gasoline, alcohol, oil.The work carbureter showed up in relation to mixing the fuel and air for lighting. Back to Brooke's Home, Optics, Wet Batteries, Products for Sale, Military Information web pages. [an error occurred while processing this directive] Page created 3 Feb 2007.